UPDATE: Toshiba's Folio 100 tablet is now available in the UK | What Hi-Fi? 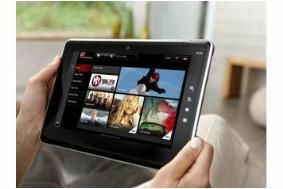 The rise of the tablets continues unabated, with the Toshiba Folio 100 the latest tablet to come on sale in the UK. Launched at IFA Berlin earlier this year, the Folio 100 is a 10.1in, Android 2.2-powered tablet, and will set you back £329. The new device supports Flash web browsing, has access to apps via the Toshiba Market Place and has an HDMI output with support for 1080p video. For more details on the Toshiba Folio 100 tablet, see our original news story below. We've got more information on Toshiba's Folio 100, the latest tablet to join the party here at IFA alongside Apple's iPad and the Samsung Galaxy Tab. It's a 10.1in tablet with Android 2.2 (so flash support), SD card slot, HDMI out, USB, support for 1080p video. The spec includes a touchscreen, webcam, wifi, Bluetooth, 7-hour battery life and it weighs 760g – twice the weight of the Samsung Galaxy Tab announced earlier this week. "Our Folio 100 media tablet offers a seamless, easy-to-use experience across entertainment, social networking and mobile internet," says Marco Perino, general manager for digital life products at Toshiba. The device comes with a selection of applications pre-installed, including Opera Mobile web browser, FBReader (e-book reader), Adobe Flash 10.1 and Fring, an app that combines with the built-in webcam to enable video calls. Also included is Toshiba Market Place, the company's new cloud-based portal service offering downloadable content. Music Place offers a wide range of music from 7Digital.com, and Radio Place provides access to internet radio stations. Powering Folio 10 is a Nvidia Tegra 2 processor, and there's 16GB of onboard storage – further expandable via SD card. The Folio 100 will be available in Q4 of this year for £329. A 3G version will follow soon afterwards. You can find out more about Toshiba's new product launches at IFA in our earlier news story.